TISZALOK, Hungary - Jeno Koka was a doting grandfather and dedicated worker on his way to his night-shift job at a chemical plant last week when he was shot dead at his doorstep. To his killer, he was just a Gypsy, and that seems to have been reason enough. Prejudice against Roma - widely known as Gypsies and long among Europe’s most oppressed minority groups - has swelled into a wave of violence. Over the past year, at least seven Roma have been killed in Hungary, and Roma leaders have counted some 30 Molotov cocktail attacks against Roma homes, often accompanied by sprays of gunfire. But the police have focused their attention on three fatal attacks since November that they say are linked. The authorities say the attacks may have been carried out by police officers or military personnel, based on the stealth and accuracy with which the victims were killed. In addition to Mr. Koka’s death, there were the slayings of a Roma man and woman, who were shot after their house was set ablaze last November in Nagycsecs, a town about an hour’s drive from Tiszalok in northeastern Hungary. And in February, a Roma man and his 4-year-old son were gunned down as they tried to escape from their home, which was set on fire in Tatarszentgyorgy, a small town south of Budapest. Jozsef Bencze, Hungary’s national police chief, said in an interview on Friday with the daily newspaper Nepszabadsag that the perpetrators, believed to be a group of four or more men in their 40s, were killing “with hands that are too confident.” Military counterintelligence is taking part in the investigation, Hungarian radio reported, and Mr. Bencze said the pool of suspects included veterans of the Balkan wars and Hungarian members of the French Foreign Legion. Experts on Roma issues describe an ever more aggressive atmosphere toward Roma in Hungary and elsewhere in Central and Eastern Europe, led by extreme right-wing parties, whose leaders are playing on old stereotypes of Roma as petty criminals and drains on social welfare systems at a time of rising economic and political turmoil. 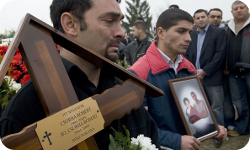 As unemployment rises, officials and Roma experts fear the attacks will only intensify. “One thing to remember, the Holocaust did not start at the gas chambers,” said Lajos Korozs, senior state secretary in the Ministry of Social Affairs and Labor, who works on Roma issues for the government. In the Czech Republic, where radical right-wing demonstrators have clashed with the police as they tried to march through Roma neighborhoods, a small child and her parents were severely burned after assailants firebombed their home in the town of Vitkov this month. The police in Slovakia were caught on video recently tormenting six Roma boys they had arrested, forcing them to undress, hit and kiss one another. Last Wednesday, Mr. Koka, 54, had just finished a cup of coffee and brought his wife supper in their bedroom when he went outside to start his orange Opel Astra for his nightly drive to work. His wife, Eva, said she heard his body hit the ground, but did not realize it until she went outside and found him lying in a pool of blood a few paces from the doorframe. “I tried to lift his hand and his head, but he didn’t say a word,” said Ms. Koka, whose brother rushed over from his home across the street and tried to perform CPR on Mr. Koka, who had been shot in the chest. “If he had not been dead he would have said goodbye to me,” Ms. Koka said in an interview at their home. Viktoria Mohacsi, a Roma member of the European Parliament, said the police - who still decline to explicitly name ethnicity as a motive in the cases - were slow to recognize the blossoming violence against the community. “At the beginning, they said it was illegal money lenders or that it was Roma killing each other,” Ms. Mohacsi said, as she visited the Koka family here in Tiszalok on Friday. “In the past five years, attitudes toward Roma in many parts of Eastern Europe have hardened, and new extremists have started to use the Roma issue in a way that either they didn’t dare to or didn’t get an airing before,” said Michael Stewart, coordinator of the Europe-wide Roma Research Network. The extreme-right party Jobbik has used the issue of what its leaders call “Gypsy crime” to rise in the polls to near the 5 percent threshold for seats in Hungary’s Parliament in next year’s election, which would be a first for the party. Opponents accuse the Hungarian Guard, the paramilitary group associated with the party, of staging marches and public meetings to stir up anti-Roma sentiment and to intimidate the local Roma population. The group held a rally last year in Tiszalok and in 2007 in Tatarszentgyorgy, the town where the father and son were killed in February, an act that some residents deplored while in the same breath complaining about a spate of break-ins in town that they blamed on Roma. Since the attacks in Tatarszentgyorgy, some local residents have joined their terrified Roma neighbors in nighttime patrols, looking for strange cars armed with nothing but searchlights. “We are living in fear, all the Roma people are,” said Csaba Csorba, 48, whose son Robert, 27, and grandson, also named Robert, were killed by a blast from a shotgun shortly after midnight in the February attack. 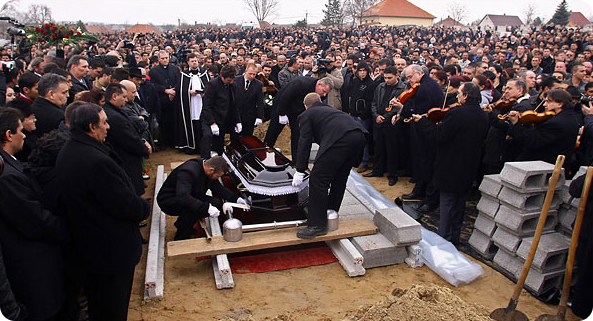 They were buried together in one coffin, the little boy laid to rest on his father’s chest. The child’s death in particular shook Roma here. “It proved to us it doesn’t matter whether we are good people or bad people,” said Agnes Koka, 32, the niece and goddaughter of Mr. Koka, who relatives said loved to bring candy and fruit to his grandchildren. “It only matters that we are Gypsy,” Ms. Koka said. It is very worrying because with increased economic instability there are people, groups and political parties in Hungary who will try to polarise the country between the ethnic Hungarians and the Roma. This tendency to blame the Romas has already been seen in other countries and it looks like becoming a problem in central Europe. Unfortunately the gains made under the (rather heavy handed) integrationist policies before 1989n are likely to be lost. In particular Romas will be affected more by the increasing unemployment and they are likely to experience more discrimination than before. There are a number of things that can be done to help the Hungarian Romas. One of these is to make them aware that people overseas are watching what is happening to the Gypsies. This improves morale. So spread the word! Tell others about http://www.jaibhim.hu and similar sites.